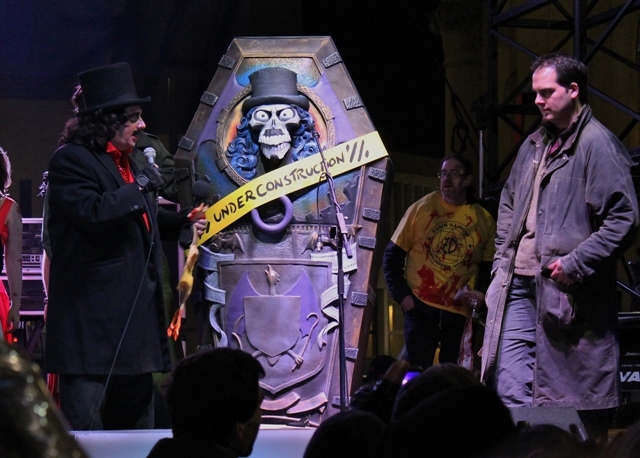 A NEW Coffin for Horror Host, Svengoolie! The old coffin will eventually find itself in a Chicago museum and this new design won’t be hitting the airwaves until 2013. There’s a LOT more to share regarding its creation and the talented folks responsible to be sure. That will definitely be delved into soon. It’s been a busy day covering TWO Svengoolie appearances and I’m still behind posting some that he’s done the last couple of weeks. Rest assured, they are on their way but I felt we Sven fans have waited long enough to see these amazing images and to hell with being chronological! Now, if you’ll all excuse me, I need to get to sleep. I’ve got to try and get some much-needed rest before the next Svengoolie appearance...tomorrow! Check out “Horror Society’s post HERE! 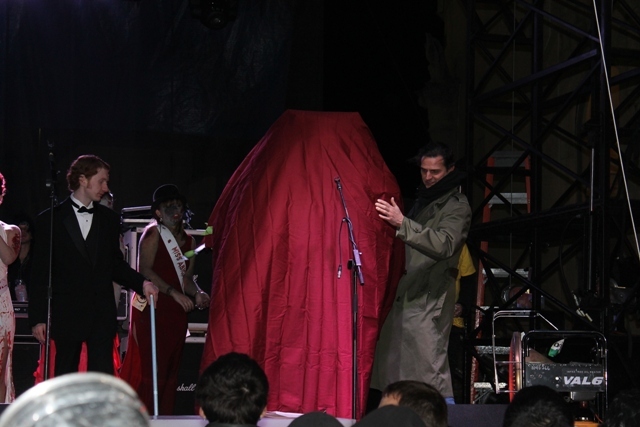 Elgin, Illinois – October 29, 2012 – This Halloween, Emmy award-winning horror movie host Svengoolie will be taking residence in a new coffin created by Acme Design, Inc.
Forty-plus years of rubber chicken barrages have taken their toll, and the original Svengoolie coffin is in delicate condition. Built by Bobby Walker and his team of WFLD stage hands in the 1970’s, the coffin’s endurance is a testament to their workmanship. When officially retired later this year, the original prop coffin will move to Chicago’s Museum of Broadcast Communications. The new coffin is being fabricated by Acme Design, Inc., a professional model, prop and prototyping company in Elgin, Illinois. Rich Koz, the actor who has portrayed Svengoolie for the last 33 years, approached Acme Design with the project. Koz invited Acme Design owner Clint Borucki and artist Ryan Guenther to the station to measure the set, discuss design elements and practical concerns, fling rubber chickens, and to talk about Koz’s vision for the new design. “One of the things the crew at Acme Design excels at is solving our customers’ problems. It was an honor to be involved with meeting the goals that Mr. Goolie set in front of us, and we hope the fans are pleased with our effort,” said Borucki. Guenther began the process by researching the history of American horror hosts, Chicago architecture, funerary practices and Svengoolie himself, to create a coffin that would tell a story. The meticulous new design draws from the history of horror hosting, with symbolic tributes to Vampira — the first horror host — and to Jerry G. Bishop, the original Svengoolie – as well as horror film. 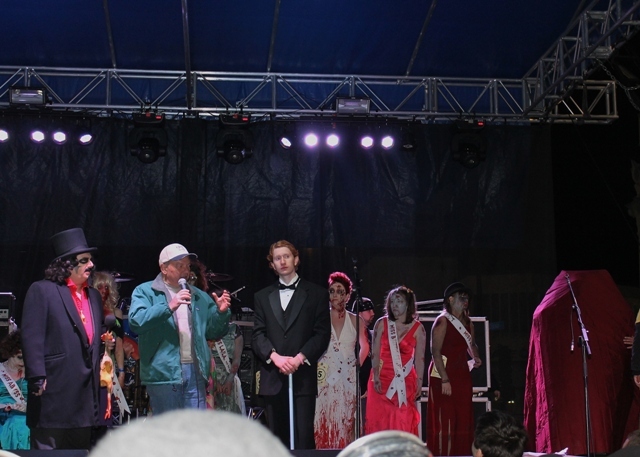 “Ultimately, film is what Svengoolie is about,” Guenther said. 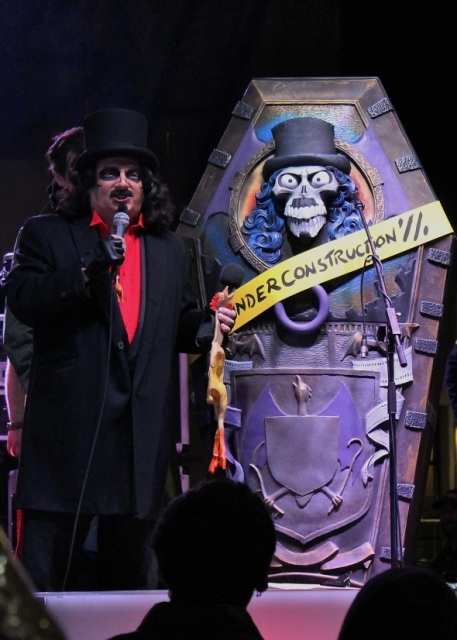 The new coffin will incorporate animated features in the lid, chicken feet coffin handles, LED back lighting, a separate base for added stability on set and an ultra-quiet fan to circulate air and keep Svengoolie cool under the hot set lights. Jerry G. Bishop, the original Svengoolie, appeared on air from 1970 to 1973. In 1979, Rich Koz first appeared as the Son of Svengoolie using the same prop coffin Bishop used, having repainted the exterior with the new character image. Today, Koz appears as Svengoolie on Weigel Broadcasting’s Me-TV, now aired in Chicago and in markets across the nation. Acme Design was founded by Clint Borucki in 1992, and has a staff of professionally trained artists and model-makers who work with film studios, video game companies, design and marketing firms and display companies, with capabilities in 3-D printing, CNC machining, molding, casting, sculpting, hand fabrication and painting. This entry was posted in Horror Hosts, Masks, Models, & Props!, Stalking Svengoolie! and tagged ACME Design, Elgin Illinois, Jerry G. Bishop, Ms Zombie, Nightmare on Chicago Street, Rich Koz, Ryan Guenther, Son of Svengoolie, Svengoolie, Svengoolie Coffin, Zombies. Bookmark the permalink. Wow! Looks great! You’re right, a historic moment for we Svengoolie fans! Thanks for staying up to post this! Thanks for the comment, Patrick! I wasn’t sure what to expect but think it looks amazing!